It’s holidays in full-gear in Omaha. There are so many theatrical performances to see (check out the list here) that will put you into a Christmas-y mood. 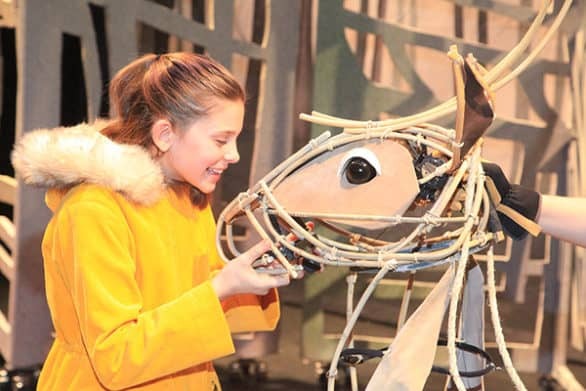 One that’s a kid-pleaser is “Prancer,” now on stage at The Rose. You can WIN tickets at the end of the post, so stick with me. 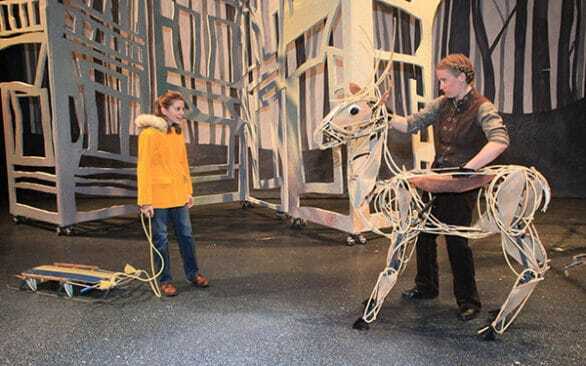 Chloe Irwin and puppeteer Shannon Wade in “Prancer,” on stage at The Rose through Dec. 18. – This was a more dramatic production than my kids were used to, though that’s not to say there weren’t a few moments that made them chuckle. – There are some stellar performances, including the young actress that plays the lead, Jessica (Chloe Irwin – keep an eye on her). The cast also includes two of my favorite Omaha actors – Nils Haaland as Jessica’s dad, and Moira Mangiameli as the grouchy Mrs. McFarland. It’s not always typical to see character arcs in children’s theater, but those three characters all had wonderful stories and changes. – Cool puppetry. Have you seen “War Horse”? That Broadway show definitely inspired the puppeteers in this performance. The Prancer puppet is a beautiful construction and the three puppeteers who move him do so with great skill. – The main character, Jessica, grapples with being 11 years old and still believing in Santa and flying reindeer. There are several points in the play where her faith is tested, and if you’re a parent who doesn’t like even the hint of “Is Santa real?” in shows, you might squirm a bit. It’s an endearing show, though, and makes everyone a believer in the end. – Snow. Expect some snow indoors during the performance. Bubble snow blows my kids’ minds, how about yours? – Suspense. If you haven’t seen the movie this show is based off of, you’ll be wondering whether or not Prancer will fly when he’s supposed to. There is an intermission, but the first half is pretty long, so I’d recommend getting your kids to go to the bathroom before the show starts. Yes. This show is recommended for ages 7 and older. It’s a long one (2 hours), and the first act has more talking than action. Unless you’re child is used to sitting through a longer show, this one might be difficult to sit through. The second act does get more exciting, and the ending is worth waiting for. I liked the show for sentimental reasons – I saw the movie growing up and thought it was magical. It’s very much inspired by “Yes, Virginia, there is Santa Claus,” if you love that message, you’ll like this show. Young Jessica Riggs’ family has fallen on hard times. Still, she keeps her belief in Santa Claus and the idea that there are miracles in the world. When an injured reindeer appears in Jessica’s backyard, she believes it is Prancer. While she is nursing the creature back to health, the whole community of Three Oaks eventually learns about Prancer, causing big problems for Jessica as she tries to return the reindeer home. Based on the cherished film, “Prancer,” this piece uses a heartwarming story and breathtaking puppetry to bring light into your family’s holiday season. When: Through Dec. 18, with performances on Fridays at 7 p.m., and Saturdays and Sundays at 2 p.m. On Saturday, Dec. 3, the performance will be interpreted for audience members who are deaf or hard of hearing. The Saturday, Dec. 17 performance will feature audio description for audience members who are blind, but arrangements must be made at least two weeks prior to the show date; call (402) 502-4637. Where: The Rose Theater, 2001 Farnam St. Cost: Tickets are $27 Main Floor and $22 Balcony. Discount ticket vouchers are available at all area Hy-Vee stores through a purchase of a Kid Cuisine product. Members of The Rose receive discounted tickets to the production. For reservations, call (402) 345-4849, go to www.rosetheater.org, or visit the box office. One reader can win four tickets to any performance of “Prancer” at The Rose! Winner will receive four vouchers, good for any performance of “Prancer,” but the winner must call the box office and make a reservation for the show. Must be 18 or older to enter. Ticket value is $108. One of my favorite Christmas movies is Elf! Don’t like Will Farrel in much of anything else, but I think he captures the innocence of the magic of Christmas. Favorite holiday movies are The Santa Clause with Tim Allen and Home Alone. My favorite holiday movies are Elf, The Christmas Story, and Home Alone. I’d love to take my daughter to see Prancer! Love love love! Christmas Vacation is easily my favorite. Can’t get enough of cousin Eddy! I think that what you do is awesome. I’ve always been impressed. I’ll make sure to take a potty break early myself. Haha.